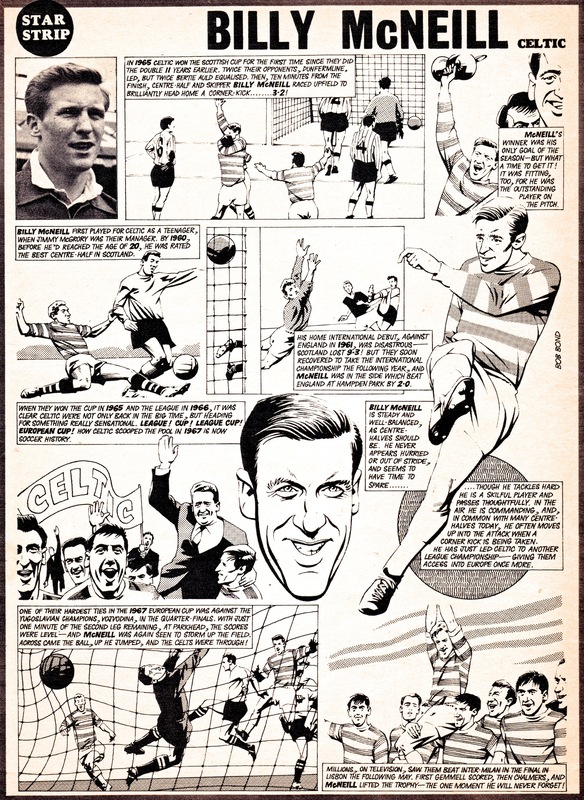 Today’s Star Strip illustration takes a look at the career highlights of Celtic and Scotland legend Billy McNeill. Captaining his club to the European Cup in 1967 was the stand-out event in his lengthy career and this particular strip was published in Charles Buchan Football Monthly just a few months after that famous day. McNeill’s career is traced back to his debut in 1960 and captures a number of its best moments, as well as some of his disasters in a Scotland jersey. What’s curious about this particular Star Strip is the inability of the artist to ever really capture a strong likeness of O’Neill; the headshot in the middle of the strip for example actually looks more like a composite of O’Neill’s Celtic teammates Bertie Auld and Bobby Lennox.